The famous charming village of Giverny around Paris is located in the south of the capital, at the right side of the River Seine. 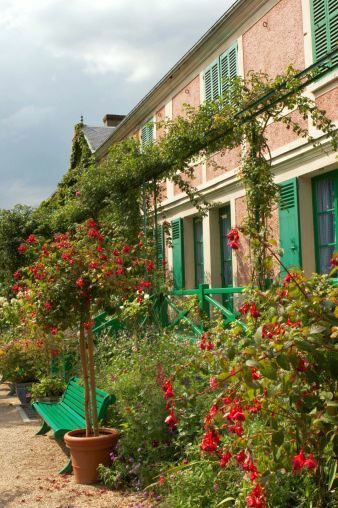 Giverny found its fame starting with 1883 when Claude Monet discovered the village whilst looking out of the train window and was instantly charmed with the beauty of the place. He found a big house to rent and he moved in within days. The domicile was a farmhouse with a great vegetable garden and an orchard of over one hectare. It was a great place for the painter in order to develop his passion such as painting, photography and of course gardening. In his letters Monet expressed his strong attachment to Giverny, where he stayed until his death in 1926. At the beginning of his settlement, he found inspiration in the surrounding sites; gradually he limited himself to his overwhelming garden, which he transformed completely into a piece of heaven with tons of flowers. Visiting his house and gardens, one goes back in time and marvels at the floral compositions and nymphéas that the Master of Impressionism once used as his greatest sources of inspiration. Just as Claude Monet marvelled at the sites of Giverny looking outside the train window, allow Paris Limousine Car Service actualize the same experience by looking at amazing sites outside a luxury car window while our chauffeur smoothly and in comfort drives you through the village towards the house and gardens of Monet.